Our economy is slowly but surely heeding the signal that carbon is the new watchword. During the past few years, a steady stream of so-called “biobased” products have been making their way to retail shelves — compostable dinnerware made from corn, plant-based laundry detergents, and bamboo flooring among them. Coke and Pepsi are now competing to be first to market with a soft drink bottle derived entirely from sugarcane or other plant materials. The emerging biobased economy even has its own label — USDA Certified Biobased, pictured here. It’s part of a federal BioPreferred program designed to help grow “green” jobs, stimulate the rural economy, promote energy independence and prompt a shift to renewable resources from petroleum, helping to manage the carbon cycle. Launched in February 2011, the label needs a little introduction since the term “biobased”, although familiar sounding, represents more than meets the eye. We advised the USDA on strategic marketing considerations related to the launch of the USDA Certified Biobased label. Here’s a primer — and why you need to be thinking about forming your own biobased strategy during 2012. Ask a consumer what “biobased” means and they might respond with somewhat erroneous definitions such as “natural” “biodegradable” or “renewable”. Consult Webster and you’ll come up short. But the USDA (and federal law) defines it quite specifically as “commercial or industrial products, other than food or feed, that are composed in whole, or in significant part, of biological products or renewable agricultural materials (including plant, animal, and aquatic materials), or forestry materials” — hence the label depicting the soil, sea and the sun. Both finished consumer and commercial products as well as intermediate products (e.g., platform chemicals, fibers, etc.) are currently eligible to earn the USDA Certified Biobased label. Standards for “complex” products (consisting of many components, such as automobiles) are being developed. Among the many products that have already earned the label are: Procter & Gamble’s Gillette ProGuide Fusion razor package; Papermate mechanical pencils made from Mirel biodegradable plastic, the Greenware line of cold cups made from NatureWorks’ plant-based Ingeo polymer; and intermediates such as Lenzing’s TENCEL lyocell fiber made from eucalyptus and DuPont’s Sorona polymer. Seventh Generation is so bullish about the label that they have certified over 60 of their household cleaning and personal care products — virtually their entire product line-up. The credibility and broadscale awareness of the brand USDA positions labeled products to stand out to consumers. In an age where consumers actively seek environmentally preferable biobased products with comparable price and performance, having the USDA certified biobased label increases shelf appeal. And marketing benefits don’t stop there. The federal government, by law and executive order, now gives purchasing preference to over sixty categories of biobased products. Biobased alternatives can also help businesses to manage volatile petroleum-driven costs and ensure sustainable supplies. Not every product made with plants or other renewable resources can qualify for the USDA Certified Biobased label. That’s because the USDA has set strict minimums for biobased content in a wide range of “designated” products. For instance, a lip balm may only need 11% biobased content to qualify, while a disposable food container needs 72%. Any product category for which a target has not yet been established must achieve minimum biobased content levels of 25%. Although this 25% bar may at first glance seem low, keep in mind that minimums are based upon the highest levels of biobased content possible without compromising performance, and to encourage participation in a market now ramping up. Biobased content is measured using a radiocarbon dating test standard, ASTM D6866. This test measures total carbon content and distinguishes the amount of “new” organic from fossil or petroleum-based carbon. This enables the “new” organic (biobased) carbon to be expressed as a percent of the total carbon. To foster transparency, encourage a level playing field and promote continuous improvement, the USDA Certified Biobased label requires disclosure of the percentage of biobased content for the product and/or package. Marketers may realize advantages if they can substantiate a product’s biobased content in support of environmental marketing claims such as “natural”, “biodegradable”, “renewable” or even “non-toxic”. However, none of these environmental attributes are automatic because of a product’s certified biobased content. Whether a claimed environmental attribute can be supported depends upon the amount of biobased content, as well as how the product was processed and transported, and other life cycle considerations. Keep in mind too, that much consumer confusion surrounds the biodegradability and recyclability of bioplastics. For instance, some resins may not be biodegradable but can be recycled (like Coke’s bioplastic PET PlantBottle, recyclable with petroleum-based PET). In addition, some traditional petroleum-based plastics are compostable in industrial (municipal) facilities, but not in backyard composters. And no plastic, biobased or otherwise, is designed to readily biodegrade in landfills. According to Kate Lewis, Deputy Manager of the USDA BioPreferred program, since its introduction in February 2011, over 500 products have been certified to use the USDA Certified Biobased label and over 400 applications are in the pipeline. She reports that her group is “looking forward to working with proactive brand owners to capitalize upon their certification and really drive this new bio-industrial revolution forward.” Now entering the market, these labelers will enjoy first-mover advantage as well as the opportunity to educate their consumers and other stakeholders about the benefit biobased content brings to their products. Whether one leads or follows, it’s clear biobased products figure prominently in our future. We predict that all products will ultimately be judged by their carbon content and their potential to effect global climate change. So, credible biobased products are and will continue to be a critical component of a long-range strategy. Short-term motivations for developing a biobased strategy, while company and brand specific, can include minimizing cost, enhancing image, reputation and consumer perception, and avoiding potential regulatory risks. So key questions for every brand owner, product manager and CEO in 2012 are What’s your biobased strategy? Do you have a team in place to bring biobased innovation into your brand and product portfolio? Jacquelyn Ottman and Mark Eisen are colleagues at New York-based J. Ottman Consulting, Inc. They advised USDA BioPreferred on the launch of the USDA Certified Biobased label during 2011 and are now advising labelers on how to market their participation in the program. Ms. Ottman is the author of The New Rules of Green Marketing: Strategies, Tools and Inspiration for Sustainable Branding (Berrett-Koehler, 2011). Mr. Eisen is the former environmental marketing director at The Home Depot. Copyright © 2012 J. Ottman Consulting, Inc. 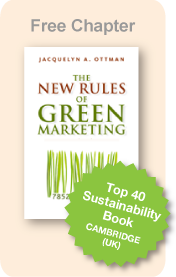 Subscribe to Jacquie Ottman’s Green Marketing Blog. Link here. Join the Biobased marketing LinkedIn group. We are just getting started.